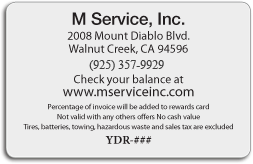 Rewards Program - M Service, Inc.
At M Service, Inc, we know you have a choice when it comes to auto service and repair, and your loyalty to us is appreciated. 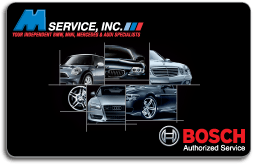 To show our appreciation, we offer you our Customer Loyalty Rewards Card. *(Exclusions: tires, batteries, towing, hazardous waste; not valid with any other offers; no cash value; sales tax excluded).